Can You Die From A Tooth Infection? The answer is YES! YOU CAN. The fact that tooth decay or infection around the tooth may sound absurd, there is evidence that suggest, what goes inside your mouth can have implications with your systemic health. There is a link between poor oral health and stroke, rheumatoid arthritis, some cancers, diabetes, respiratory infections, heart diseases and pregnancy problems. There are several theories to explain the link between gum disease and heart disease. One of them is when oral bacteria gets into the bloodstream through pores in bleeding gums and attach themselves to fatty plaques lining the blood vessels in the heart. Plaque can obstruct the blood flow, which then leads to heart attack. In another theory, arterial inflammation caused by periodontal bacteria restricts blood flow, eventually causing heart attack. In both theories it can lead to life threatening conditions. On a side note- a 2007 paper published in The New England Journal of Medicine suggests that a regimen of an intensive periodontal treatment may reverse atherosclerosis, the buildup of fatty deposits inside arterial walls, and reduce cardiovascular risk. 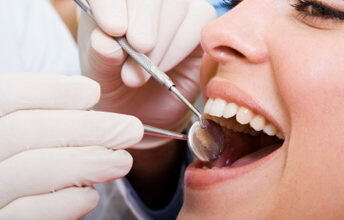 Untreated a tooth or gum infection can spread to vital organs. If still left untreated it can lead to death. Example an infection in a lower wisdom tooth can spread down and block the airways and cause suffocation and death. An infection in upper wisdom tooth can spread up to the eye or brain and cause blindness or death. According to Huntington news back in March 2011, a Cincinnati man who died because the tooth infection spread to his brain. A 24 year old was advised to have it removed but he decided to tough it out because he did not have any insurance or money to cover the dental expenses. He was advised to have antibiotics and pain medications. He decided to take the pain medication, not knowing that the infection can spread to the brain. Here at Jauhal Dental we look for critical signs of infection. The most important being is how far the infection has spread. If it is approaching such areas as the eyes, eyelids or down the neck it is best to see a dentist or hospital emergency.